All he said is, "I want to change the world." One of the year's must-see documentaries is Jodorowsky's Dune, profiling the Chilean filmmaker and his ambitious attempt to adapt Frank Herbert's Dune in the 70s. Jodorowsky amassed one of the most insane casts ever: Salvador Dalí, Orson Welles, Gloria Swanson, David Carradine and Mick Jagger of all people. This outstanding documentary, directed by Frank Pavich of the music doc N.Y.H.C. previously, debuted at last year's Cannes Film Festival where I first caught it and fell in love with it. I finally spoke with Pavich over the phone in March for a fun discussion on this excellent doc. As always, I prefer interviews in-person where I can speak directly with the subject, but I could only arrange time with Frank via the phone. I decided to chat with him anyway, being such a big fan of the film, and it turned out to be a great discussion about the doc and Jodorowsky worthy of sharing in full. I first saw the film at the Cannes Film Festival in the summer of 2013, so my chat with Frank started on that topic, covering the coincidence that Jodo was there for the premiere of his own film The Dance of Reality anyway. I hadn't seen the film since Cannes last year, so I just rewatched it because I wanted to get a proper refresher, even though there was still so much vivid about it in my mind. Frank Pavich: It's good, because it's actually changed a bit from Cannes, too, we actually made structural changes to kinda make it flow a little bit better; and improved some of the animation and some of the artwork that we just didn't have the time to exact and do what we wanted before Cannes, because we really made it under the wire to get into that. I noticed that. I remember there were a couple points where I thought, "Um, I haven't seen this before!" That was my first question - I was in Cannes and also went to see Alejandro Jodorowksy's The Dance of Reality. Was it just coincidence or was it something you actually coordinated that Jodorowsky would be there with that film and you guys would be there with this film? Pavich: We kind of coordinated it as much as it can be coordinated, because of course both films have to be accepted. But, Michel Seydoux, is obviously the producer of his new film, The Dance of Reality, and he's a co-producer on our film [and appears in it]. I always knew from the first day that Jodorowsky said yes, that he would be involved in this film with us, my dream was always for it to be at Cannes. I had never been to Cannes before, but in my imagination it was the perfect film festival for it to premier at. It just happened that his film was completed around the same time as our film. So Michel, I believe he submitted Dance of Reality to Cannes and they figured out which section it would go into, and they decided it would go into the Directors' Fortnight. And once it was accepted, then Michel handed them a copy of Dune. As it was told to me by the guys of the festival, they kind of rolled their eyes, like, "Give me a break. We're already accepting Dance of Reality. Now you are trying to shove in this little documentary as well? Come on!" They popped in the DVD and they said they all watched it kind of wide-eyed. They couldn't believe how amazing it was and how fantastic Jodorowsky is in our film. They fell in love with it and thought what a perfect thing to have both films there at the same time. So it just kind of worked out in the Jodorowsky infection, the magical Jodorowsky infection. There's three films that Jodorowsky is represented in - his son Brontis' daughter is in Blue is the Warmest Color. And then, of course, Only God Forgives was dedicated to Jodorowsky. And that was also in the main competition. So that's four films with Jodorowsky. And one of his two main girls in Blue is the Warmest Color is a Seydoux; is Michel's brother's granddaughter. So it's kind of… I guess the Seydoux's and the Jodorowsky's kind of ended up everywhere this year. It was kind of perfect. Maybe I'm jumping ahead in time, but I believe your film has reignited the fascination with Jodorowsky and, in time, will sort of be the second coming of him. Not only does it show what he was working on back then in his history, but it also sort of shows he's still relevant today and, look, he has a film that just came out, and you know, get into this guy. Find more about him. That's what I love about your film so much, it brings that energy and focus back to him. Pavich: That's great. That's definitely one of the goals for sure. We kind of made the film so you don't have to know who Jodorowsky is. You don't have to be a fan of his films. You don't have to know what Dune is or science fiction. You can kind of go in completely blind. But his personality is so incredible and so magical. I was actually in Texas two days ago and I did an interview with somebody there who had seen El Topo and had seen Holy Mountain and did not like them. He was like, "Oh, I don't like these movies. I don't like this style." 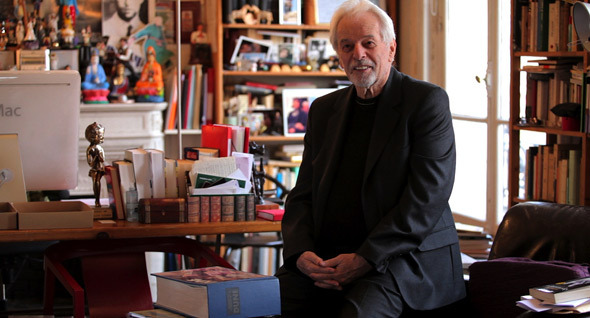 Then he saw [Jodorowsky's] Dune and then he fell in love with Jodorowsky. Now we wants to go back to go revisit to those two films, to see the new film. Even if you think you don't like him, chances are you just don't know him. Once you give him a little bit of time, you can't help but fall in love with him. If you don't fall in love, you don't have a soul, because he's just so amazing. Just now I was reading this article in the NY Times, which is about him. It came out online today and it's going to be in the paper on Sunday. I was actually crying, like actually crying reading it, reading the things that he said, reading the things that his son Adan said. It is so powerful, so amazing. I don't know of any other human being quite like him. How exactly did this come together? A lot of film nerds are familiar with the Dune story. They know it. They know everything about Jodorowsky and what got him to this point… At what point did you meet him, and did it all come together and it was like all of a sudden, "Okay, let's make the documentary of this story. How can we pull it together?" How did that happen? Pavich: It's really obviously just kind of comes from learning the story. I'm a fan of Jodorowsky's films. I thought his films were great. But I had no connection to him personally. I never met him. It wasn't like my uncle and his grandfather went to school together. There's no real connection whatsoever. I was coming in as a complete stranger, coming in completely blind. I had been a fan of his films. I had heard about this missing Jodorowsky film, and that it was Dune of all things, which is something that we all know. Once you start kind of learning about it, you learn how amazing it is. You learn about his spiritual warriors and the cast of actors that he had included, the musicians, and all this amazing stuff. Then when you learn that it's not an unrealized film—it's actually completely realized. It just happens to be on paper. It's all there. Everything is there. It was screaming for a story to be told about it. So I contacted him out of the blue. I found him, or rather, I found an agent he has and I sent his agent and email and said, "Oh, is it true that you represent Alejandro Jodorowsky? "… "He's not even a human being? How could he have representation?" So I sent her an email and said, "If it's true that you represent him, I would love to speak with him about possibly doing a documentary about his experiences with trying to make Dune." And a few weeks later, I woke up one morning and opened up my email and there was an unread message, a new message from Alejandro Jodorowsky himself, which is amazing and terrifying. It's terrifying because obviously it's intimidating. It's this great man that's sending you this message. But I was also scared because what could be in that message? Could it be just: "No. Leave me alone"? Could it be the worst thing possible, which is, "Oh, somebody is already making this into a documentary - you are too late"…? One thing I'm curious about, I noticed there's a whole section about how he was pained by what happened. Did you notice that Jodorowsky was excited to start talking about this story again and record it? Did you get that feeling he was anxious to be out there again? Pavich: I think he's thrilled to speak about it. It's a very important part of his life. And I think he's thrilled to speak about it because it also teaches a lesson. Every movie he makes, every book that he writes, every comic that he does, it's all about… there's this recurring theme of transformation. So I think he wanted to share this story to get the idea out there that this is not a negative. This is a positive. He doesn't feel bad. He doesn't feel heartbroken. He's not crying over the fact that he didn't make it, because he felt that he did. It's like, "Here it is. It's all ready to go. It's completely done." He's completely satisfied. So I think the pain that sometimes comes out in the film is more about the world in general. Why does everything have to be based on money? How did that get to be the most important thing in the world? People obsess over that like it's the end of the world. Why do you have to open up the newspaper on Monday morning and see the box office receipts and see which film made how much money? What does that have to do with anything? How is that a barometer of anything aside from marketing? He finds that really disgusting. He finds the fact, basically, he could not make this film because of that reason. He finds that repulsive and disgusting. That's what bothers him, as opposed to the fact that he didn't get to do it. It's just the reason of how the film industry, industry underlined, works. I absolutely love the book behind this. The first time I thought, "I wish you guys could bring that out as a tour." We could sit down and have a fireside chat with him and he would tell the story like he did to Refn and we could get that experience. Because now we know it exists and just want a chance to look through it. And I also love the animation sequence made from it. Speaking of the animation sequences in this film, how did those come together? Was there ever a consideration to do more of them? I wanted to see more of the animation after the few scenes we do get, they look amazing. Pavich: Well, you know - I think we needed to keep it limited, because I think if we included too much of the animation or if it was just animation for animation's sake, or just animation so we could see more of his film, then it kind of loses some of its power. Then it kind of enters the realm of a DVD extra. It's about his experience making Dune, but it's also about so much more. So we kind of tried to really go to the book and choose the sequences from his Dune that could have a larger statement and a larger meaning; that different sequences would represent something that he's speaking about. Not just describing the scene, but that are speaking to the same thing he's thematically speaking about. So we tried to limit it like that. But it was just so much. As he says, the whole thing could be made in animation today and it would be jaw-dropping. Do you think that's a possibility? Do you think this documentary's success could bring enough attention to it that some producer out there could say, "Okay, let's do this." Pavich: I really hope so. I would love to see… or not would love. I will love. I look forward to seeing the things that happen when this documentary comes out. Will someone come along and truly make the film animation? Will the book somehow be published for the public and be able to be seen by everybody? They think they made 20 copies of that book. Only two exist for sure. Jodorowsky has one. Michel Seydoux has one. That leaves 18 missing. I can't imagine that they all ended up in a landfill. I cannot imagine that. There has to be some copies in someone's attics, in some executive's left-hand bottom drawer, in someone's basement. There has to be. I really can't wait for when this film comes out, people maybe get to realize, "Oh, that's what I have sitting on the shelf. That's what grandpa gave me. Oh, I had no idea what it was." That's the way I start seeing these books come into the public. That's really going to be exciting. One of my favorite parts about it is the message at the end. I want to go out and tell everyone, "Go see this! It's so inspiring! It will make you want to make films. It will make you want to take on the world." That's why I'm such a big supporter of this, I want that message to be spread throughout the world through Jodorowsky and through what you guys have created. Pavich: I've seen the film, what, 250 times? I can't even count how many iterations I've seen; of the completed film, the works in progress, the raw footage that we sent through three years. I transcribed every interview. I know this movie inside and out and still, when I watch the final film, I still get choked up at the end still. And when the credits roll and the movie is over, I still feel invigorated and I feel infused with ambition that I want to go out and I want to change the world just like he talks about. It still affects me. He's that powerful of a person. Considering this is such a great doc about an unfinished, mysterious project from the past, are there any other cool projects you've heard about that would be great to investigate and figure out what happened and turn into another documentary? Pavich: I don't know, because I don't think… there are certainly other unmade projects which are fantastic. Taschen published that book a couple years ago about Kubrick's Napoleon and how interesting that is. But I feel like aside from Jodorowsky's Dune, I feel like when a film doesn't happen that's kind of the end of the road. There may be a couple script drafts or maybe a little bit of artwork, but never something you can fully realize like his. And never have I ever seen a not-completed-film, an unrealized feature film, that still gets out into the world and still influences so many other projects. That's kind of what's exciting about this, is that, yes, it's unmade, but it's still alive. You can go see a film as recently as Prometheus, which was, what, a year or two ago. 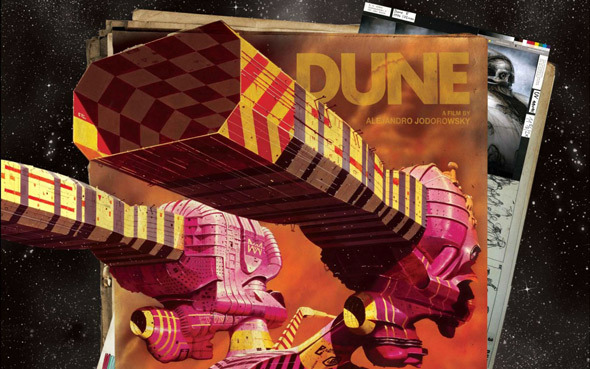 You can still see the influence of Jodorowsky's Dune. It's still out there. If I feel like when this documentary comes out, if that book were to be released or if there were to be an animated version, then it would even go further and more people would see those ideas inspired by them and will maybe take them further. I completely agree. Who was the toughest person to reach out to and interview? Or was there someone you really wanted to talk to for the documentary that you never could actually get? Pavich: The only people that we were missing, of course, are the people that are no longer with us, other than Dan O'Bannon, who passed away a couple years before, and then Moebius, who was very sick when we started the project and then passed away while we were in the middle of it. But aside from that, he had such a power over these people and such amazing influence on them that when… It makes it very easy to call up H.R. Giger, to call up Chris Foss, to contact these people and to say, "I'm telling the story about Alejandro Jodorowsky's Dune with his full cooperation and with his full involvement. Do you want to come in and speak about him?" They all jumped at the chance. They all truly love him. Diane O'Bannon said that until Dan O'Bannon's death, he referred to Alejandro as his guru. That he had this incredible effect on these people's lives and he made these people's lives better. He saw something in them. Except for Dan, none of the other artists had worked in film before. But he brought them into this film and they went on to go have film careers. All he said is, "I want to change the world." And he did change the world. He changed the world through the influence of his art. He changed the lives of these artists, of his spiritual warriors. His own life changed. He ended up going in a different direction. So he really did change the world. That was always his goal. The others I would've loved to hear from would be Orson Welles or Salvador Dali. Just the idea of wondering what they would think about, if you asked them, looking back on it and how much it influenced even though it didn't happen. It would have been fascinating to hear. Pavich: Oh, for sure. Sometimes we're at a film festival and there will be a Q&A and several times people have asked, "Did you think about contacting Mick Jagger?" I said not really, because he was such a peripheral character in the film, it would have been like stunt casting for the documentary. We couldn't get Carradine, obviously. We couldn't get Orson Welles, obviously. We couldn't get Salvador Dali, obviously. So to try to get him, it just felt cheap. So we just kinda left it with the more concentrated core people. Me too. I think that's why it's so exciting this is all happening now—he's still alive. He's still making movies. He's still around. And now it's, sort of, the second coming of Jodorowsky and we can all revel in that, and not only live in his great films of past, but also see what happens in the future from here on out. Pavich: Right. Exactly. I'm really curious to see what's going to be next. He said he's got another film that's ready to go right now. We'll see what he comes up with. Thank you for your time. Again, I really do appreciate it. Best of luck. I'll definitely keep supporting the film as much as I can. Pavich: Whenever I see you on Twitter I'm always so happy. I'm like, "Oh! He's still behind our film! This is amazing!" Starting at Cannes until today. Thank you so much. It really means a lot, obviously. I just fell in love with it. And pretty much exactly as you said you were going for, which was to capture that spirit, by the end I came out so enthusiastic. It will never leave me. I'm now growing into a huge Jodorowsky fan where I can just go tell everyone and get people who have never heard of him before into him. So I'm out there now and I'm fighting for Jodorowsky. Pavich: That's it. Preach the Jodorowsky gospel. That's it. Exactly. Thanks again. I'll talk to you soon. I appreciate it. Pavich: Absolutely. Thank you so much for your time. I appreciate it as well. Thank you to Frank Pavich for his time speaking with me, and to Gary Springer for arranging. Jodorowsky's Dune, the documentary directed by Frank Pavich, is now playing in limited theaters from Sony Pictures Classics. For more info and theater listings, visit the official website. The doc will also be on iTunes for rent soon. Please see this doc, just find it and see it, it's wonderful and above all inspiring. Enjoy. Mr. Pavich is kickass. Thanks Alex.